As a destination wedding photographer, I've had the opportunity to photograph weddings in 12 different countries. This experience has helped me develop a lot of great tips and best practices for ensuring that every client gets the most out of their destination wedding photography. Whenever I photograph a destination wedding, I always encourage my clients to do a day-after session so we can spend some serious time on portraits, and also make use of some of the local surroundings. After all, the charm of a specific country is why a client chooses it for a wedding. It would be a shame not to capture portraits of the bride and groom in the local surroundings. By doing a day-after session, clients can spend more time with their guests on the actual wedding day. This photo was actually taken at the hotel where my second photographer and I stayed -- not at the hotel where the bride and groom stayed, which was also the site of their wedding. 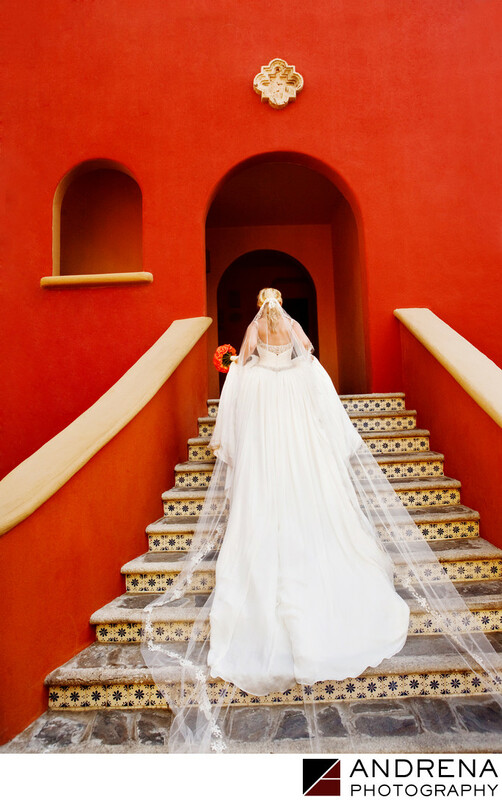 The bride's Badgley Mischka wedding dress looked stunning going up these Spanish-tile stairs, and the orange and rust colors of the hotel's walls provided a gorgeous pop of color. This image has been published numerous times. Photographed at the Sheraton in Cabo San Lucas, Mexico. Wedding photographed at the One and Only Palmilla in Cabo San Lucas, Mexico.